This spring break we revisited Greystone Mansion in Beverly Hills for a tour of the historic 50,000 square foot house. It's definitely a grand estate, with a very sordid past involving the murder of oil tycoon Edward Doheny's son. In addition to the very scandalous back story of the mansion, it's also a popular filming location, which you've probably seen as the backdrop to at least one movie or TV show, my favorite being The Big Lebowski. 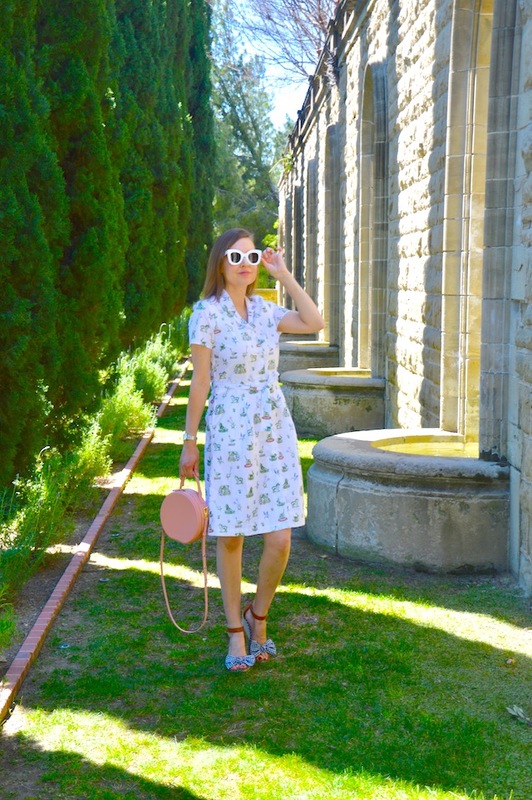 I thought this topiary shirt dress would be the perfect dress to wear while exploring the house and strolling around its stately grounds! 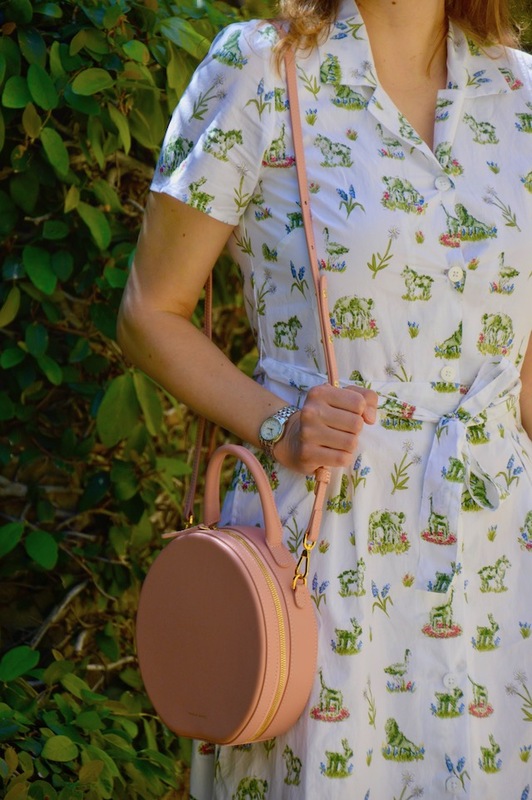 If you look closely, the print of this dress features the most adorable animal topiaries! 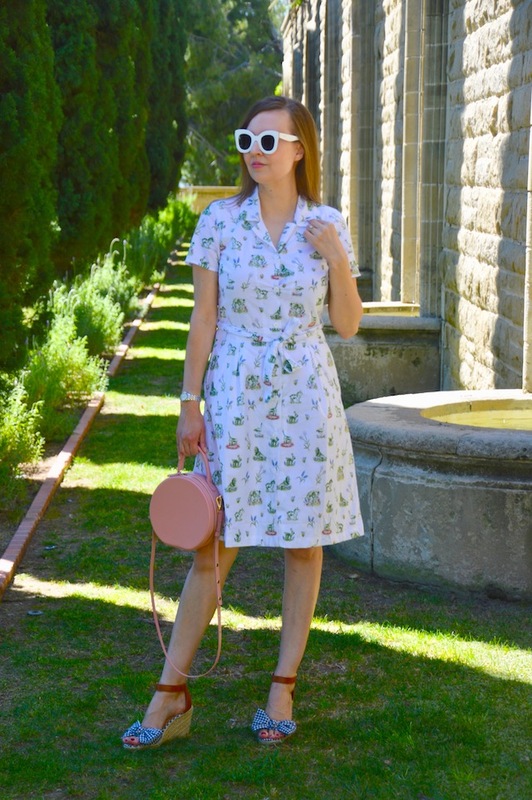 From lions to giraffes, these animal topiaries would probably feel right at home in the beautiful gardens that grace Greystone Mansion. 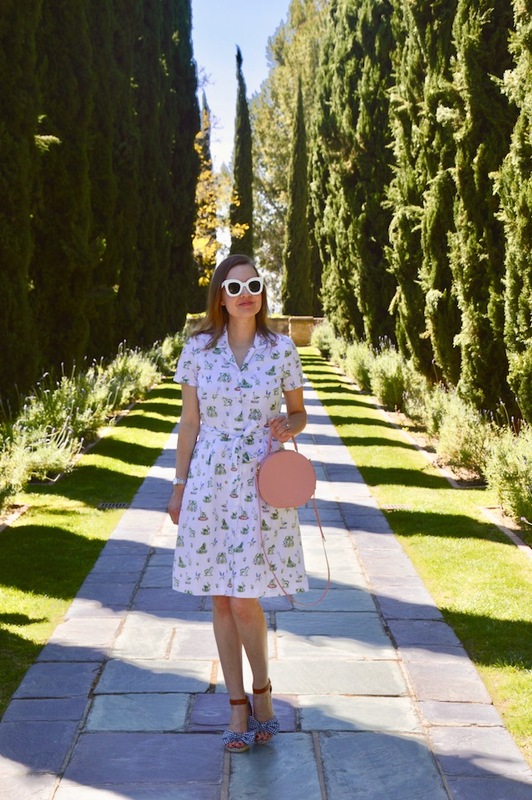 I definitely wouldn't mind living at Greystone Mansion either and I suppose if I did, I could have the gardeners create topiaries to match my dress! That would definitely make for an epic blog post! Well, maybe if I start playing the lottery, that dreamscould become a reality but, for now, I'll just have to settle for the dress! I love circle bags for spring! Katie, you are so cute! Can you imagine if the gardens had topiaries the same as on your dress?! That would be totally epic! I love this dress and these photos! This post will be featured on tomorrow’s #SpreadTheKindness Link Up! Thanks for joining the party.